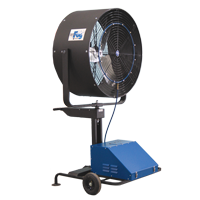 Schaefer Ventilation has re-designed and re-launched its popular VersMist® portable misting fans for additional convenience and durability at a lower price. The new PVM18C is similar to the new PVM18, except that it has a slightly larger water reservoir, built-in wheels and a pull handle for greater ease of movement. 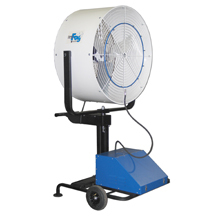 Both fans are ideal for cooling work areas, rescue squads, firemen, patios, or sidelines etc. when limited electricity and no running water are available. 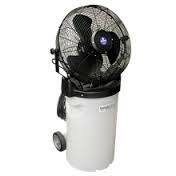 Portable Low Pressure Misting Fan. Fill it up, plug it in, turn it on and chill! The Versa Mist reduces air temperature by as much as 30°F. Low pressure mist technology combines fine mist and high speed air movement for highly effective “person” cooling indoors and outdoors. The 18”, 3-speed fan provides up to seven hours of uninterrupted use and is ergonomically designed for portability. The Versa Mist is ideal for cooling work areas, rehabilitation stations, outdoor events, emergency workers, patios, and sidelines. ​Features and Benefits: Available with or without wheels. Wheeled version has integrated handle and wheels for easy movement. 10 or 14 gallon built-in water reservoir for portability. Adjustable fan head for targeted cooling. Rapid mist evaporation produces 16,000 Btu/hour (1.4 tons) of cooling. 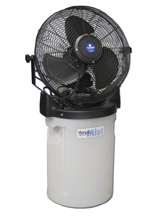 Pump and fan assembly separates from the reservoir for quick and effortless setup, cleaning and storage. Integral tip switch to turn power off if unit is knocked over 25 foot outdoor rate power cord with integrated GFCI plug for standard wall outlet. UL507 rated for outdoor use. Imported fan heads. 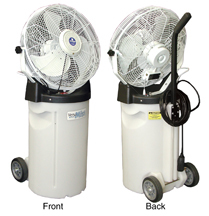 Portable "person cooler" combines fine mist and high speed air movement for personnel cooling indoors or outdoors. Includes a 10 gallon reservoir and pump and fan assembly. 5 hour water reservoir capacity. Molded handles in reservoir for easy movement, empty or full. 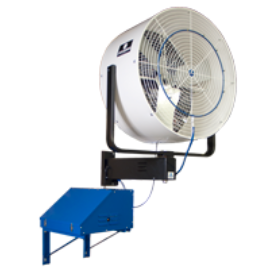 18" UL507 rated 3-speed fan produces up to 6,600 cfm of cooling breeze. Built in pump produces 2 gallons/hour of fine mist. Rapid mist evaporation cools the air up to 30°F and produces 16,000 BTU/hour (1.4 Tons) of cooling. Safe. 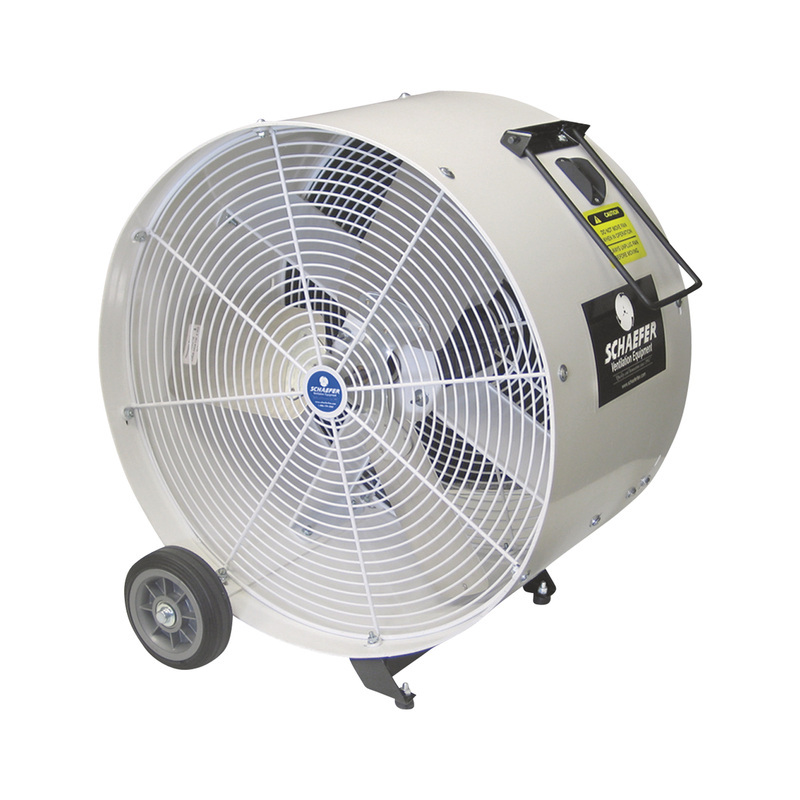 The fan has OSHA-rated guards and is UL507 rated for outdoor use. The 25' outdoor rated power cord has in integrated GFCI plug. Unit has an integral tip switch that turns power off to the unit if the unit is knocked over. Fan and pump assembly securely locks to the water reservoir. Portable. Unit comes with its own water reservoir (10 gallons or 14 gallons) for up to 7 hours of uninterrupted use and a 25' extension cord to connect to a standard wall outlet. Pump and fan assembly is easily separated from the reservoir for cleaning or storage. Available with white or black fan heads. Fans can be angled up or down for optimal cooling. 42" tall when assembled. Tank dimensions are 20" tall x 15" diameter. The VersaFog is a powerful, self-contained, high pressure mist cooling system. Using the natural process of evaporative cooling, VersaFog has the ability to reduce air temperature by a staggering 30° F up to 65 ft. away. Great for cooling outdoor areas where people gather! Reduce air temperature by as much as 30 degrees! 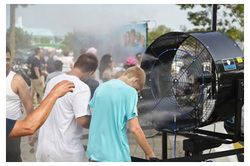 The Schaefer VersaFog™ Systems are the ultimate high-pressure misting (fogging) fans on the market. The VersaFog™ can reduce the ambient air temperature by as much as 30 degrees, providing the ultimate benefit of coolness without wetness. Quick connects allow for two satellite units to be attached to the main unit. 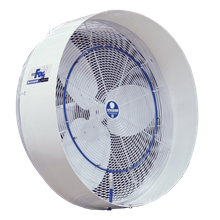 The oscillating fan provides the necessary forced air velocity to evaporate the "fog" generated by the high-pressure pump. 24" fan base with pump. Operating system requires 110 volt electricity and standard garden hose for water hookup. The VersaFog family of powerful, self-contained, high pressure mist cooling systems uses the natural phenomenon of evaporative cooling, to economically reduce air temperature by 30 ⁰ F up to 65 feet from the unit. 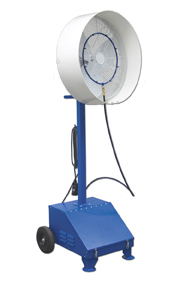 Base unit includes misting fan and 3/4 hp, 1,000 PSI, Industrial CAT pump with automatic low-pressure shut-off. Additional satellite fans can be connected to the base unit with quick connect line, 1 additional for 36" fans and two additional 24" or 30" fans. -Automatic low-pressure shut-off to prevent pump damage. - OSHA compliant guard spacing on 24" and 30" models. - 25 foot cord with integrated 20 amp GFCI plug with 15 amp circuit adapter plug included. - UL507 rated for outdoor use for 24" and 30" models. - Rugged polyethylene housing included for 36" model, optional rugged polyethylene housing offered with 24" and 30" models. - 2 year limited warranty with manufacturer. Braided nylon hose or polyurethane tubing. Brass nozzles with stainless steel inserts. 40 to 300 psi working pressure. Removable nozzles for easy cleaning/replacing. Connectors for easy attachment to fan. Five foot leads with 3/4" female garden hose ends.